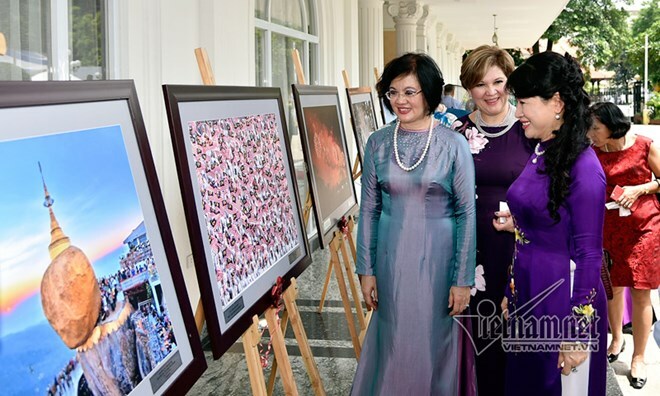 Hanoi (VNA) – The Ministry of Foreign Affairs and the ASEAN Women Community’s Circle in Hanoi (AWCH) jointly held the ASEAN Golden Festival in Hanoi on August 26 to mark the 50th founding anniversary of the ASEAN. Attending the event were Tran Nguyet Thu, the spouse of Prime Minister Nguyen Xuan Phuc, Nguyen Nguyet Nga, , representatives of Foreign Ministry and Hanoi, and ambassadors from ASEAN countries and other countries in Hanoi. Addressing the event, AWCH Honorary President Nguyen Nguyet Nga, who is the spouse of Deputy Prime Minister and Foreign Minister Pham Binh Minh, said that from a divided region with conflicts and poverty, ASEAN has become an area of peace, unity and prosperity, a community of self-reliance, dynamism and solidarity, a family with shared vision and a common identity. She highlighted that ASEAN is now playing a central role in the region with a rising position in the Asia-Pacific region and the world. On behalf of ASEAN countries’ embassies in Hanoi, Philippine Ambassador to Vietnam Noel Servigon said that the festival is an important event that helps improve public awareness on the diverse cultures of ASEAN members through the introduction of their music, dances, games and foods. At the event, participants enjoyed an art performance featuring ASEAN countries’ cultural identities, and joining traditional games and foods.